Last year, a group of researchers from Advanced Architecture of Catalonia and Joris Laarman studio in Amsterdam developed a new 3D printing articulating arm that can create 3D printed models in the air freely. The arm was originally used in car manufacturing. 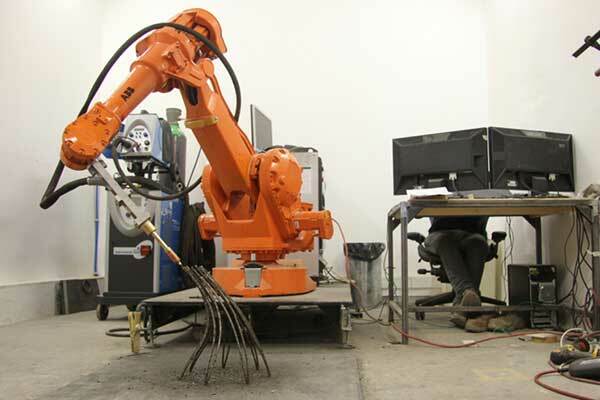 After further months of researches and improvement to the technology, another interesting implementation of the research comes to the surface; Joris Laarman’s machine included a welding machine to create 3D metal printing instead of the previous version. The machine can create 3D metal models in the 3D space independently. 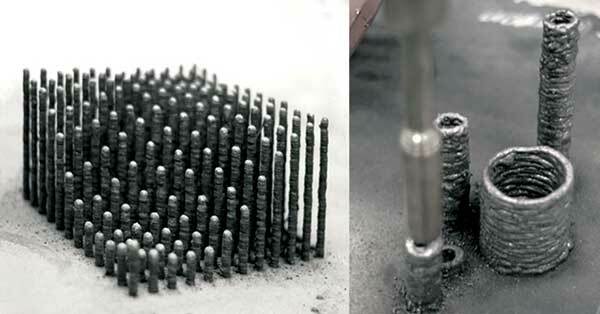 The concept behind this 3D metal printing technology is quite simple but the implementation is not. 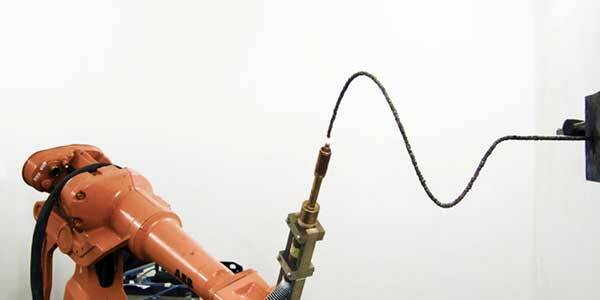 The welding torch attached to the robotic arm adds small amounts of the metal allowing it to print lines in the room 3D space floor or walls. The above video shows the 3D metal printing technology in action and how the robot arm builds the metal lines and bars. Previously, a technique called Selective Laser Melting (SLM) or electron beam printing was used to 3D metal printing, but does not support large models and it was an expensive one. The new technology opens the doors to create large 3D printed models without the need for support and can help printing larger scale objects such as industrial designs, furniture, and architecture models. The figure above shows the robotic arm building the 3D metal lines in the 3D space without no support. The lines are built and support each other to stand still. This example shows the welding torch creates the spiral line bit by bit and the 3D metal model itself is attached to the wall independent from the gravity factor. Here is a closeup to the created lines and bars, the figure on the right shows a closeup to the welding torch creating the metal line. While the technology is still new, it is promising enough that many think it can take the 3D metal printing to a new level and possible implementations. The MX3D technology funded a solution for the space limitations of the 3D printed models, but can it solve the problem of the price. Can the new technology help creating 3D products that can be affordable comparing with its competitors on the traditional production lines?